A minor single track from Port Charlotte heads inland across the Rhinns of Islay to meet the north west coast of the island at Kilchiaran Bay. Here it meets a similarly narrow road which has made its way in a generally north east direction from Portnahaven. Just above the head of Kilchiaran Bay and in the valley of the Abhainn na Braghad stand the remains of Kilchiaran Chapel. Kilchiaran Chapel stands only a few yards off the road, and it is possible to park nearby without obstructing any of the passing places and access the field in which it stands via a gate. 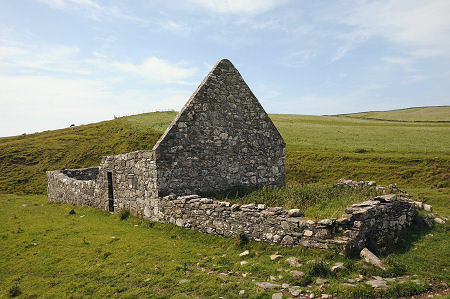 The chapel comprises a rectangle of walls standing to around head height, and an east gable which looks to stand to its full original height. To the east of the east gable is a burial enclosure, whose surviving walls are of a much lower height. Early references talk about the chapel comprising only the east gable, with the other walls ruinous. What you see today is the result of the efforts of the Islay Historic Buildings Works Group to partially restore the ruin in the early 1970s. Early references also talk of the chapel being surrounded by a burial enclosure, though note that this was reduced in size when the road was built to the south east of the chapel, and further reduced by river erosion on the north west side. We could find no signs of a burial enclosure on our visit, and the surrounding ground now appears to form part of a wider landscape which is heavily grazed. Presumably at the time of the restoration of the chapel in the early 1970s the surviving grave slabs from the churchyard were moved inside the chapel. 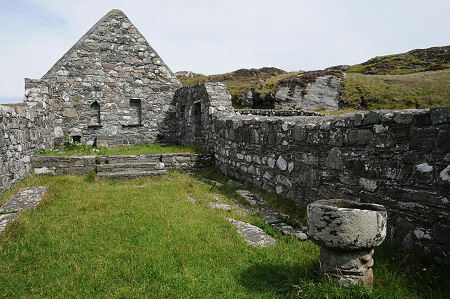 No one knows for sure, but it is possible that Kilchiaran Chapel was built as far back as the early 1200s. It is also known as St Ciaron's Chapel or Cill Chiarain, and the name shows that it was dedicated to St Ciaron, also known as St Kiaran, an Irish monk. This tradition of dedication was carried on when St Kiaran's Church was built near Port Charlotte in 1897. The chapel measures some 14.5m by 5.1m, and the walls are around three quarters of a metre thick. A metal grilled doorway gives access to the interior of the chapel. It is not obvious how much stood before the restoration, but today's visitor finds an oblong interior comprising what seems to be a long nave, with a chancel or sanctuary at the east end raised by three stone steps above the nave. The inside of the east gable is home to two recesses, one square topped and the other pointed. Between them is a low stone plinth, presumably inserted during the restoration to indicate the position of the altar. 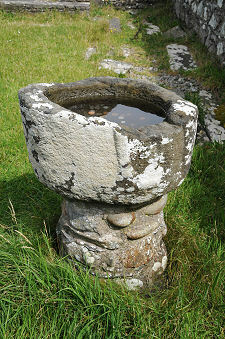 Towards the south west corner of the interior of the nave is a stone font, broken but still capable of holding a fair depth of water. Meanwhile a considerable number of grave slabs, presumably recovered from the surrounding burial ground, have been laid inside the nave, in the shelter of the two side walls. 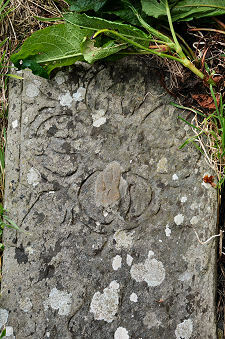 These appear to date back to the 1300s, 1400s and 1500s, and come in a variety of styles found across the West Highlands. 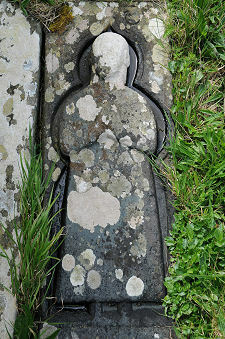 Several of the grave slabs still have recognisable carvings of swords and foliage, but the most striking is the grave slab which comes complete with the sculpted effigy of a priest.